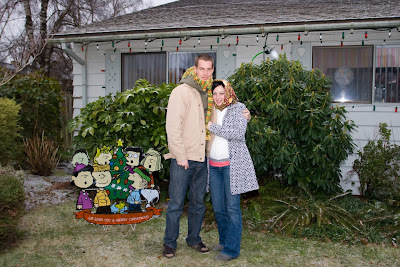 Even though we are not over with our Christmas break vacation in Oregon, we thought we'd do a Christmas update before the new year rolls around. Hanging out with Melissa's family has been really fun, but since so much has happened since the 21st when we got here, we'll just hit on a few highlights! 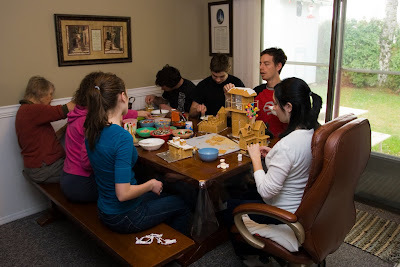 ...this year Matt contributed a light house, complete with a real light, and Melissa made the house from Disney's UP. 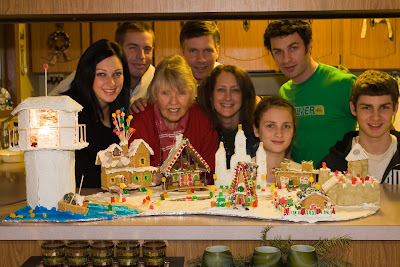 Neither were an easy feat, but we are no fair-weather gingerbread builders! Everyone's creations turned out very well though...probably one of the most impressive villages to date! 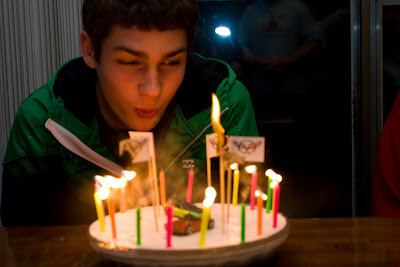 Jared turned 17 right before our eyes, (and at the same time some of his cake decorations decided to go up in flames...ha ha)! On Christmas Eve Melissa's family acts out Luke chapter two. 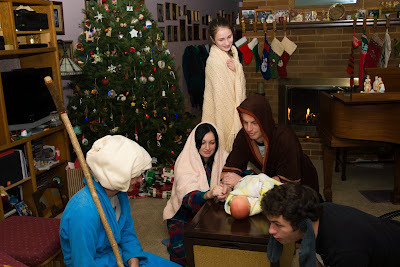 Due to Melissa's condition there was no way for us to get out of playing Mary and Joseph, (even though Mary still had a very suspicious bump long after bringing forth her son). David playing Mary's donkey-ride was a nice touch this year as well...each year we find a way to bring a little more insanity to the production. 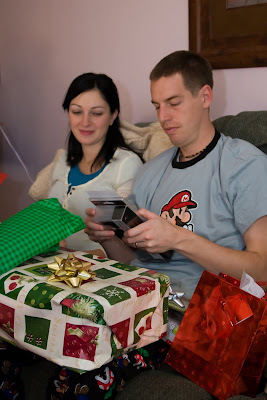 Christmas morning was full of the fun energy, good food and laughter that always accompanies the big day. Somehow we made away with a haul! 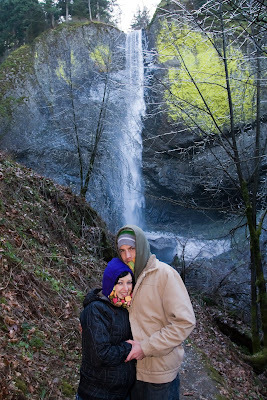 Thank you to everyone for spoiling us way beyond what we deserve! 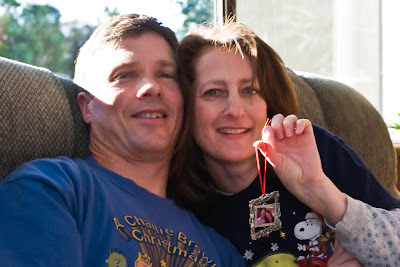 This is Melissa's mom and dad holding a picture of themselves, (it's on the ornament we gave Mom for Christmas). 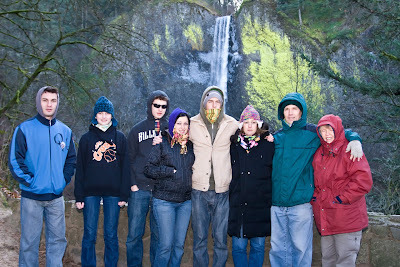 ...and Multnomah Falls. 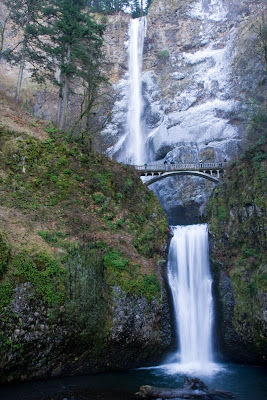 Multnomah is pretty famous, but this was the first time even Melissa, a native, had seen it in person partially frozen. Very pretty! 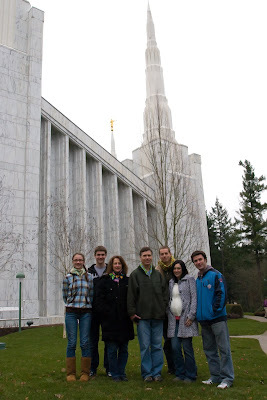 Yesterday we all went to the Portland Temple to walk around the grounds. Matt had never seen it before. 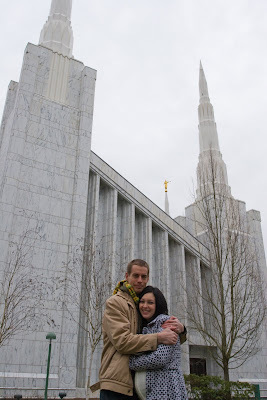 We think he was impressed...it is a very gorgeous temple with really pretty grounds, even in the winter. 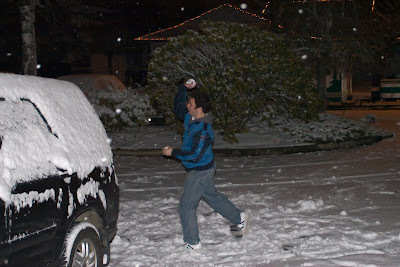 ...by nightfall we had a good couple of inches, (which of course meant snowball fights)! 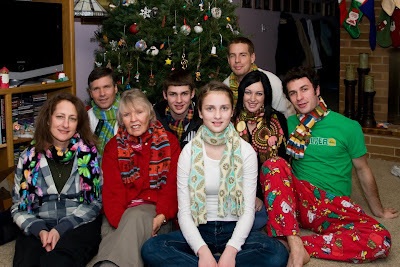 We just can't believe Christmas is over, but we are glad to still be with family. We hope everyone had a great day remembering our Savior, and we will see you in the New Year! Come back soon and safe! Matt H is back, and we need to hit up the chinese buffet on 5th! Sweet! We'll be there...don't you fret!